Frequently Asked Questions (FAQ) Module has been developed by PHP-Mods. Using this module, you can create specific questions with their correct answers. 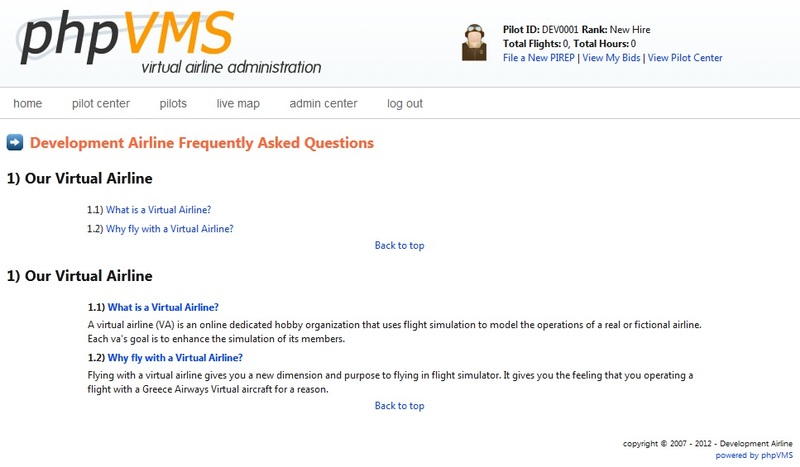 This will reduce your workload as your pilot's frequently questions will be answered using this module. Add and edit your va's frequently asked questions grouped into categories. This module aims to reduce your VA's Staff Team workload. The following installation steps have to be followed by those who have never installed any version of the Frequently Asked Questions Module. Unzip the Frequently Asked Questions File you downloaded from github. Go to www.yourdomain.com/FAQInstallSql in order to run the FAQInstallSql folder. This will install all the database tables. After the installation is completed, do not forget to delete the FAQInstallSql folder from your server. After the installation, a link will appear automatically in the add-ons section of your phpVMS Admin Center.